Review: By the middle of the night, the wind was like a day hurricane. It was furious with the house, furious with the trees, enraged by every last one of us. It threw things at the windows and it beat on the roof. I was reading For Whom the Bell Tolls and my mother was dreaming her sleeping pill dreams, and at 2 a.m., exhausted, I put the book down and covered my head with the blanket and repeated my mantra, Go to sleep go to sleep go to sleep." Forest fires ravage the state of California, but for many readers experiencing a forest fire is unimaginable. However Laura McNeal brings a California forest fire to life in Dark Water, a novel that combines deep-rooted emotions, love, and humor so adeptly that readers, when they reach the end, are left with a longing to read more. Pearl DeWitt is a fifteen-year-old living with her mother in Fallbrook, California in a small decrepit home on her uncle's avocado farm. She has a strong sense of responsibility and devotion - that is until she meets Amiel, a migrant worker who lives in a self-constructed hut in the forest. Amiel, a young man who can barely speak, but who entertains others through circus acts, steals Pearl's heart and turns her world upside down. It doesn't take long before she sneaks out and goes to meet Amiel who is trying desperately to avoid being caught by la migra. Their relationship develops slowly throughout the book, and Pearl faces groundings for her behavior, but the feelings she has for him come to a head when the Agua Prieta fire looms nearby causing a mandatory evacuation. Pearl must decide between her family and Amiel who is bound to be killed in his shanty home that is right in line of the fire. Pearl learns a lesson in that fire, and it comes at a great price. Dark Water is a wonderfully written book. Pearl grapples with issues at home as well as typical issues that teenage girls face. She has a father who has distanced himself from the family, but who is desperately trying to be a part of her life. Her mother is a woman who struggles with responsibility and who adds humor to the story. Her great goal is to harvest silkworms so that she can process the silk and weave it into priceless cloth. Readers are let into the life of the silkworm, and at one point Pearl concludes, "'Maybe you should get a puppy,' I said, afraid that she was getting too attached to creatures with what seemed to me a fairly high incidence of accidental death." However, the silkworms can be seen as somewhat symbolic of the frailty of life in general - which Pearl comes to realize later in the book. Pearl's uncle and French wife own the avocado farm and take good care of Pearl and her mother, and her cousin Robby is a strong companion. He's perfect in every way. Readers are charmed by their Franglish - as Robby was brought up speaking French in an effort to not lose his French heritage. But the real depth comes when she meets Amiel and experiences a completely new side of life - love. Though it is never really expressed - as their communication is very difficult, readers can sense the depth of her feelings that lead her into the most horrific event in her life. Deep Water is simply an excellent read on so many levels. We would like to thank Random House for providing a copy of Dark Water for this review. 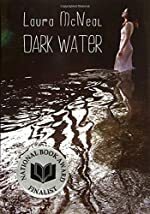 Have you read Dark Water? How would you rate it?